Super Fast Goat Grub – Goatly Greens, Eggs & No Ham! A quick weeknight (or morning!) meal that’s got all your essentials – protein, (good) fat, (good) carbs, antioxidants, vitamins, minerals and fiber! 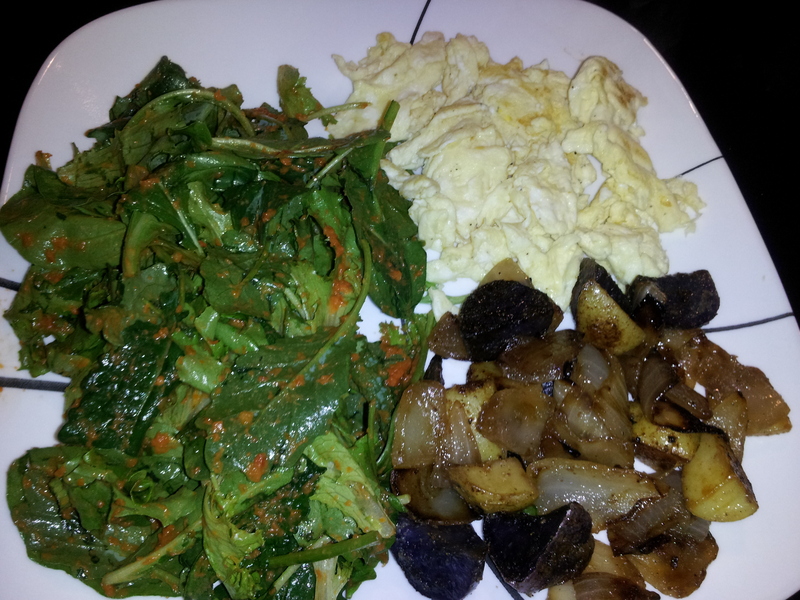 Eggs, Greens, and Potatoes! Dressing is ready! I guess it’s not really vinaigrette because there is no vinegar! I think Balsalmic would be yummy in here, but I didn’t have any! 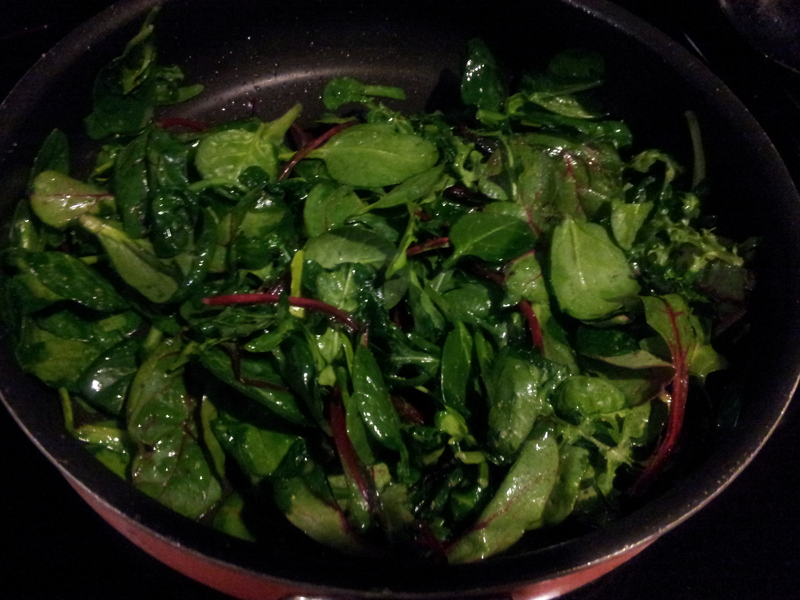 Put the greens in a bowl and add a few spoons of the thick mixture. Toss with tongs. I use Organic Girl I Love Baby Kale mix. It’s amazing. Hello potassium, vitamin C, fiber, protein, Vitamin A, Vitamin K, just take a look. Nutritional powerhouse. 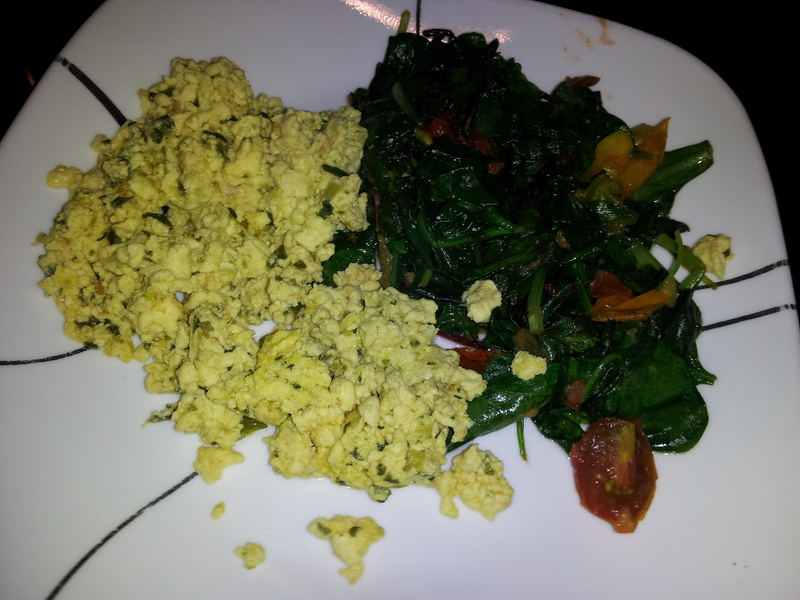 Here’s the sauteed greens with the heirloom tomatoes and scrambled egg beaters with fresh basil and garlic! For my eggs, I put them in a cup and add a splash of almond milk and beat them with a fork really well (and add in any herbs or spices at this point) before I pour them in a pan which has already been heated over medium heat and is hot. The addition of the almond milk makes them really fluffy! I love it. You’re done. Well balanced and delicious! The greens give you so many nutrients, fiber, protein, calcium, I could go on forever! All the garlic and onions in this dish – hello antioxidant city. The eggs give you protein and using the egg whites lowers the fat and cholesterol. The potatoes are more protein, more antioxidants and of course – carbs!!! Plus the coconut oil adds good fats. The sundried tomato dressing gives you a good shot of healthy fat and lots of vitamins and minerals like lysopene, vitamin A, plus more fiber… Really, need I say more? 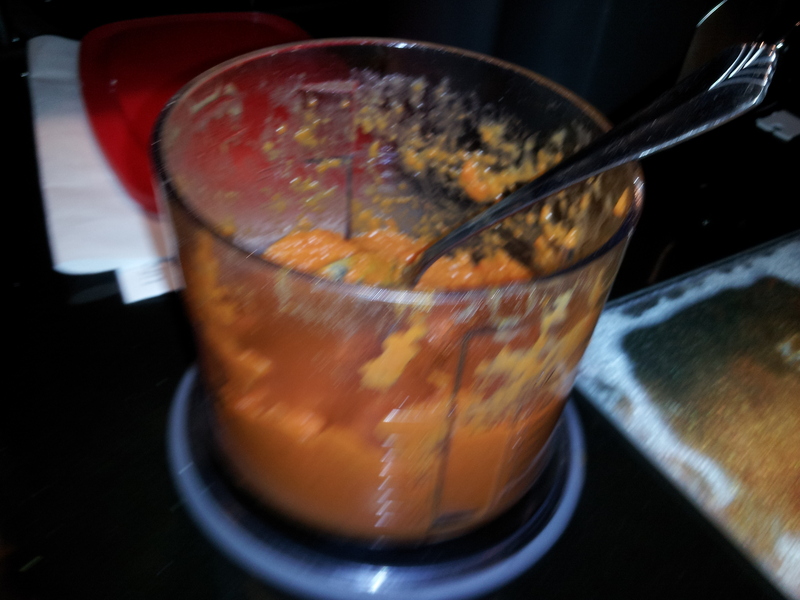 Not the prettiest thing, but yummy! I promise. Even Pooky ate it. 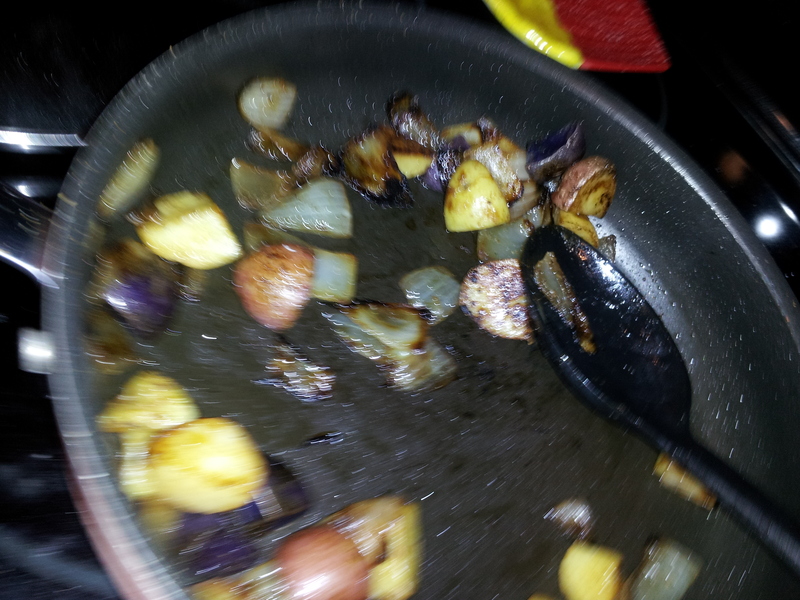 NOTE – for the potatoes, I think its crucial to use tri-color potatoes when possible. This will cut down on your starch and allows you to get in more antioxidants (think purple potatoes which have Anthocyanin and more fiber and more protein!) I use mini – red, gold and purple ones. They rock. Ohhhh wait? Hard training day? Still hungry? Need a treat? 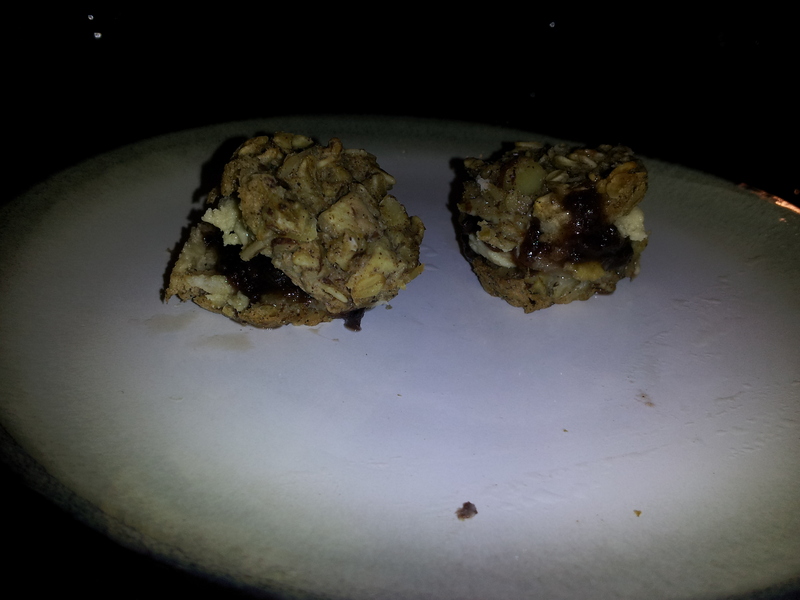 I ended it with my mini versions of my Goatmeals (recipe here). 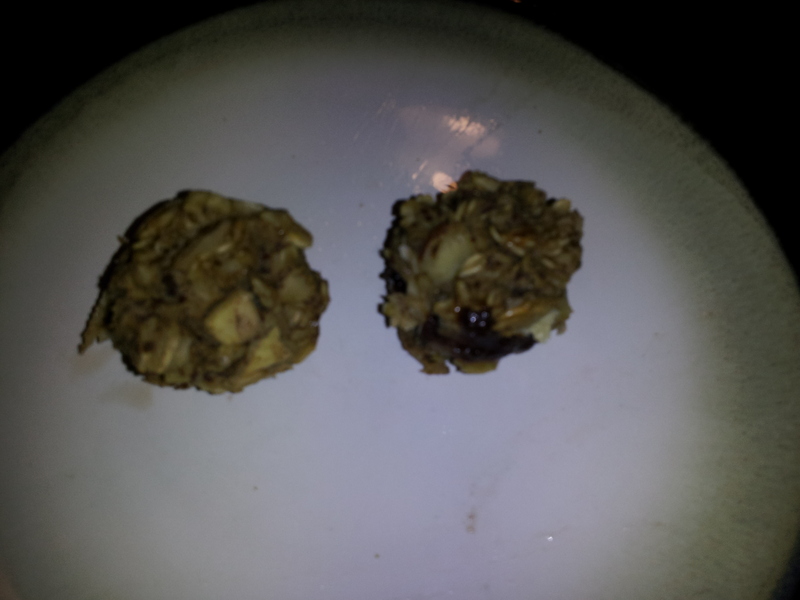 I took two of the mini apple cinnamon ones and cut them in half (had to do when they were partially frozen to keep them from breaking since they are so small). Added a tiny spread of cashew butter and cranberry apple preserves (from a local specialty store, Bella Cucina. AND SO good…although I think they have a fancy name for it, but I’m sticking with preserves). OMG awesome. Again, less than beautiful, but delicious – I swear! I will work on my photography and buy prettier plates soon. Promise. Two more won’t hurt, right? Gina over at Skinnytaste.com used the same Kale mix today! And, over easter I made a vinaigrette like the lemon, olive oil concoction you and your mom used to use and it was delicious. Yay! Sounds good! That brand makes a bunch of other good mixes too. I still can’t get my mom’s lemon and oil just right….